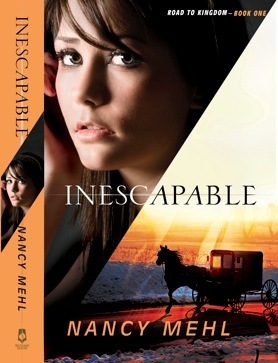 Inescapable by Nancy Mehl was my first Mennonite book. I surprisingly enjoyed it. Nancy has a way of capturing your heart from the very first few pages. Lizzie Engel ran away from her Mennonite community when she was only eighteen. The last thing she ever wanted to do was return. But five years later, Lizzie finds herself in a dangerous situation and she returns home feeling it would be better to face the scrutiny and criticism of her parents and former community than to become a victim of the person who is sending her threatening letters. When Lizzie returns home, she feels safe for a while but then the threats start back up. She doesn’t know who to trust. This young woman is faced with mending broken relationships and with learning to let go of anger and resentment from her past. It’s really the only way she can learn to love and to trust. I loved the way Nancy mixed the Mennonite world, the secular world (which Lizzie has returned from), and regular non-denominational belief in God. She was able to keep me guessing, keep me engaged, and even mystify me quite a number of times. I received this book free from Bethany House in exchange for a review. I highly recommend it! Interview with Debut Novelist Krista Phillips – Sandwich with a Side of Romance GIVEAWAY!